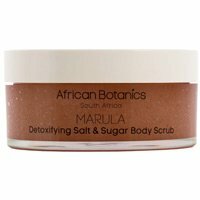 Why we love it: This multi-tasking body scrub not only smoothes and exfoliates skin, but also stimulates a natural detoxification process by increasing blood and lymphatic flow. Raw Cane Sugar gently removes dead skin cells from the surface while Pink Himalayan Crystal Salt helps to detoxify the body. Nutrient-rich African Marula, Baobab and Kalahari Melon Seed Oils hydrate and soften the complexion. Massage onto damp skin with upward circular motions 1-3 times per week. Follow up with moisturizer. Sucrose, Capric/Caprylic Triglyceride, Sodium Chloride Sole (Himalayan Crystal Salts), Vitis Vinifera (Grape) Seed Oil, Glycerin, Sclerocarya Birrea (Marula) Seed Oil**, Polyglyceryl-5 Oleate, Silica, Citrus Paradisi (Ruby Grapefruit) Essential Oil, Adansonia Digitata (Baobab) Seed Oil, Citrullus Lanatus (Kalahari Watermelon) Seed Oil, Citrus Aurantium (Neroli) Essential Oil, Tocopherol Acetate, Citronellal*, Farnesol*, Geraniol*, Limonene*, Linalool*. *Constituents of natural essential oils used. ** Certified Organic.